Edway specialise in recruiting and providing construction staff. Edway Labour Hire specialises in the recruitment and provision of industry specific, skilled labour, to clients across a range of sectors including but not limited to; Building and Civil Construction, Infrastructure, Industrial and Engineering, Rail, and Mining. Our reputation has been built upon a bedrock of quality, reliability, integrity/honesty, and unparalleled service which in turn enables us to attract and retain the best people and has earned us the respect and loyalty of our clients. tradespeople who work for us enjoy flexibility, variety, and the opportunity to work on a range of challenging and exciting projects across different industrial sectors whilst constantly being encouraged to up-skill. To us, safety is more than just a set of rules for safe work practices, it’s part of Edway Labour Hire’s culture, and integral to the way we do business. We will never allow our commitment to providing a safe workplace for everyone to waiver or be diminished in any way. And we uphold this assurance through continuous training, strict safety measures, and a zero-tolerance policy toward any neglect of safety issues. 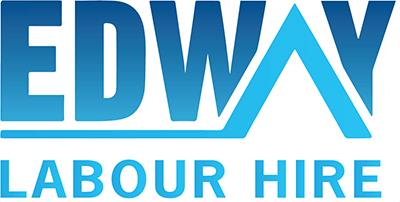 Whether your project is big or small, Edway Labour Hire’s pledge is this: We will supply our labour on time, at the right price, at the quality requested and, always within the required safety standards. It’s unofficially called ‘The Peace of Mind’ guarantee.